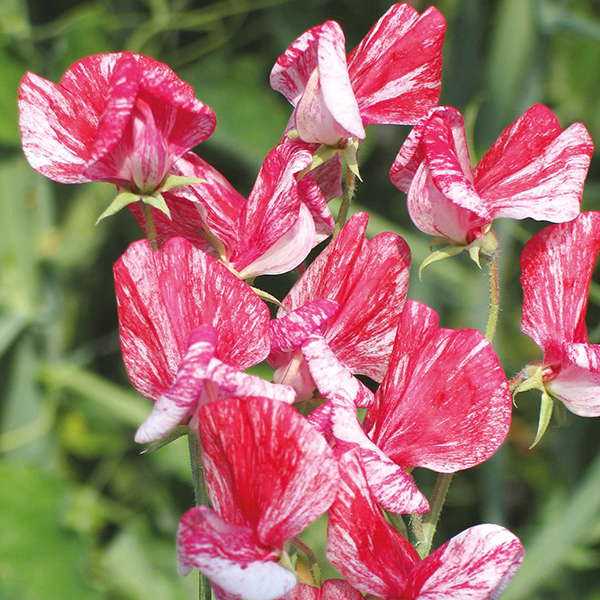 This old-fashioned sweet pea has intense perfume with beautiful raspberry ripple flowers. Lightly scented, they are superb grown up trellis or as cut flowers. Sow: outdoors, March to May, 1.5cm (½in) deep in flowering position. Thin to 20cm (8in) apart. Or, during autumn or early spring in peat pots and place in a cold frame or greenhouse. Plant out during March or April, allowing 20cm (8in) between plants. Train young plants up a fence or wall or support with sticks or netting.